Two-for-one today! Kale seems like it’s everywhere these days, but it really is great stuff. I tend to buy “baby” kale when I can find it in my grocery store and mix it in with some arugula for a salad or add it to a soup. My next favorite thing to do with kale is the recipe below. 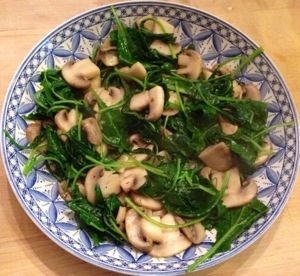 I have made the mushroom-kale combination as a side dish a handful of times, but recently I was in the mood for it when the rest of the family wanted pizza. 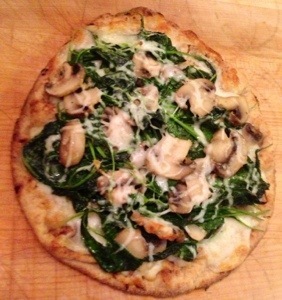 No worries – mushroom and kale pizza was born! This pizza is made with pre-made naan bread from the grocery store, but you could always use a store bought dough or traditional pre-made pizza crust. See my ham and Swiss pizza recipe for tips on using different crust options. In a large skillet melt the butter with a bit of olive oil. I like to use both – the oil keeps the butter from burning on you and the butter keeps the oil from getting too hot and smoking. Add the mushrooms and sauté for a couple of minutes. When they start to soften, add the kale and stir to wilt it evenly. Add some spice – I like Northwoods Fire from Penzey’s – or simply some salt, pepper, and garlic powder. If you are serving as a side dish, you are set. It’s that simple! To use it on a pizza, pop a pizza stone, if you have one, in the oven and preheat to 450. Spread some olive oil on your crusts. Again, I used pre-made wheat naan bread. 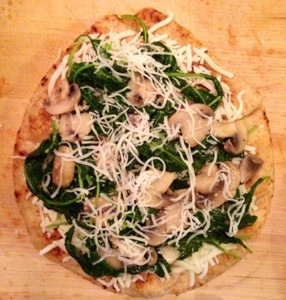 Cover the naan with the mozzarella cheese, then the mushroom and kale combination. I like to put a little more cheese on top so everything holds together better when it’s done. Slide onto your stone or a baking sheet and bake for about 8 minutes. That’s it! Hope you try this dish either way and enjoy it! Let me know what you think and share with your friends! This entry was posted in Dinner, Lunch, Pizza, Side dishes, Vegetables and tagged Bread, Kale, mushrooms, Naan, penzey's, pizza. Bookmark the permalink.